Cooked cereal reminds me of growing up. My mom made us cream of wheat on most mornings and it was so good. I remember sometimes having raisins in it, but always having a pat of butter on top. I can still smell it, and it warms my heart. These are some of the memories I hope to have with my daughter as we grow together. Luckily, she is all about cooked cereals, just like her mama. Oatmeal is a favorite breakfast option in our house. We love stovetop steel cut oats, and we make that often, but some days I am pressed for time, what parent isn’t?! 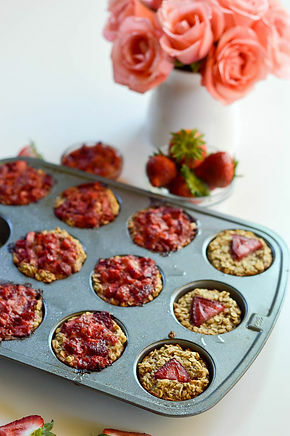 So these make ahead baked oatmeal cups are a life saver and really tasty. Oh, and toddler approved! 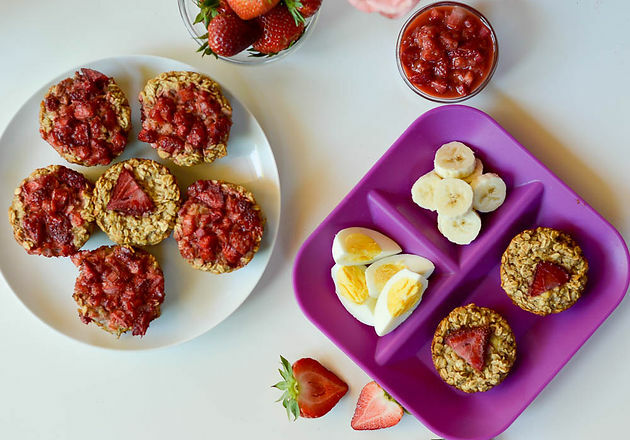 They are made in muffin tins, which is helpful for little hands and you can be creative with the toppings. 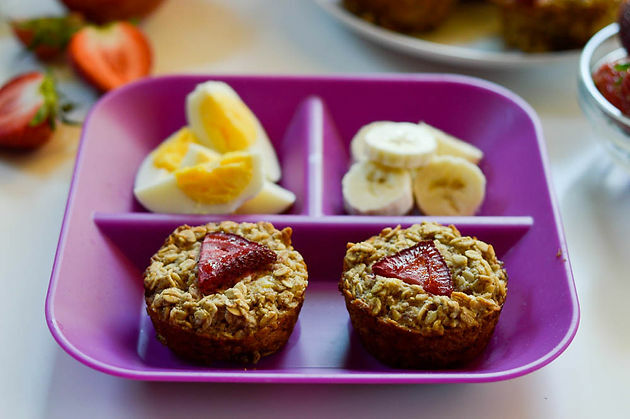 You get all that yummy oatmeal flavor, perfect for breakfast or even a quick snack. My daughter loves to top her muffin with almond or peanut butter and I am the same way! Just rounds it out and gives a little more protein and fat to help keep us satisfied. Oatmeal is a great fiber filled breakfast option; you can really up the nutrients with add-ins. This recipe includes bananas, coconut oil and flaxseed for added protein. Plus, they are vegan which is a nice option if anyone in your house has allergies to eggs or dairy and/or you are aiming to include more plants in your diet. 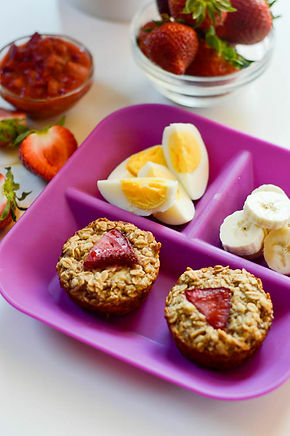 Hope you enjoy this breakfast option and making it your own! Happy cooking. Make your flax egg. Combine 1 tablespoon ground flax seed with 3 tablespoons water, stir to combine and let sit in the refrigerator for about 10 minutes until the flax absorbs the water and it looks slimy. In a medium/large bowl mash your banana, add room temp milk, maple syrup, vanilla extract and coconut oil. Whisk to combine. Add all of your dry ingredients – oats, cinnamon, salt, and baking powder. Using a 1/4 cup measuring cup, scoop batter into muffin tins that have been sprayed with cooking spray. Place in 350F degree oven and cook for about 33-35 minutes until set-up and a toothpick comes out clean. Let sit for at least 10 minutes before trying to remove them from the muffin tin. Keep in airtight container in the refrigerator for up to a week or freeze for up to a month. To reheat: place refrigerated cups in microwave for 30-45 seconds until warmed through! In a medium pan add oil, strawberry and rhubarb. Cook for about 3 minutes or until cooked down a bit. 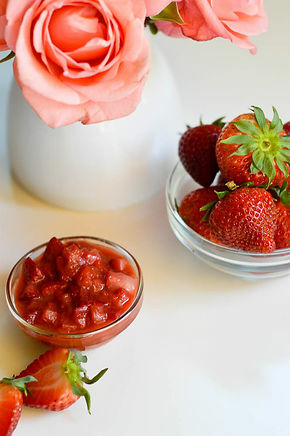 Add your sugar and water and let cook another 3 minutes so it becomes jam like in texture. Store in airtight container in refrigerator for up to 3-5 days. ** this substitution will make it less sweet in flavor.